Finding a good-sounding amplifier can be tough. I’ve put together this guide and recommended models to help you find the best 4 channel amp for sound quality. As class D amps are also more common, I’ve added some important information about those as well. 2. What is a 4 channel amplifier? 4. What is a class D car amp? What is a 4 channel amplifier? A 4 channel car amplifier, as you may have already guessed, is extremely similar to most 2-channel (stereo) car amplifiers. However, there are a few differences you should be aware of. Just like 2 channel (or single-channel “mono block” amps) they contain a power supply with steps up the +12V battery voltage to a higher one. This is necessary to create a more power in the speakers you use. This is because when only 12V is available, a speaker can’t be driven with much power. That’s largely related to Ohm’s law and the basics of electrical power. While similar, a 4 channel models are built slightly differently. They’re a bit more compact as they incorporate 4 (instead of 2) independent audio amplifier signal paths and amplifier sections. Many 4 channel amps also feature a 2/4 channel input switch. This is useful if connecting to a head unit with only 2 channels available in order to drive 4 channels of power. Most today also are “bridgeable” – that is, they can be connected to drive a single speaker load from 2 channels for more power. 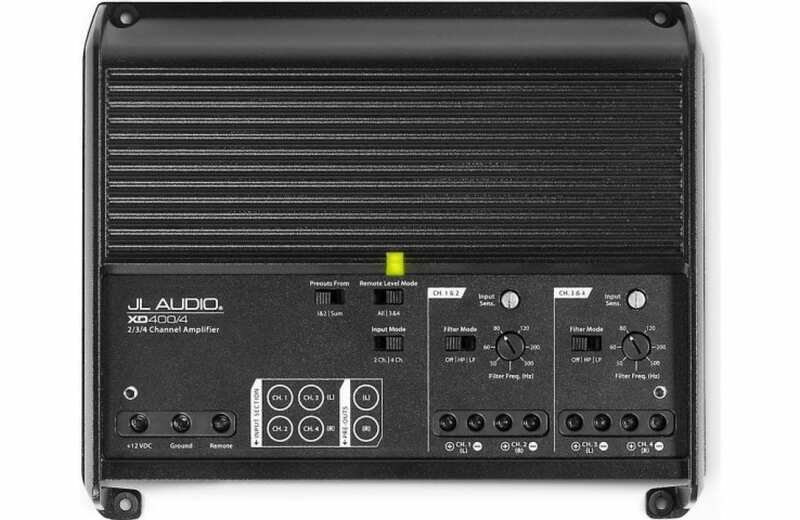 Some 4 channel amps are configured slightly different than others and have additional options like bass boost or crossovers that can only be used for 2 of the 4 channels. These types of details vary from brand to brand and model to model. You need to be careful when shopping to ensure the amp you’re buying meets your needs. Diagram showing the basic differences between a 2 and a 4 channel car amplifier. Both work the same way: the +12V supply is “stepped up” (increased) to a higher voltage with both positive and negative outputs. These supply the amplifier transistor stages which are fed with the signal from your stereo. This basically just amplifiers the very small signal from your stereo to a higher voltage that can drive speakers with a lot of power. Note that 4 channel amps are usually more compact than other models (especially class D amps). 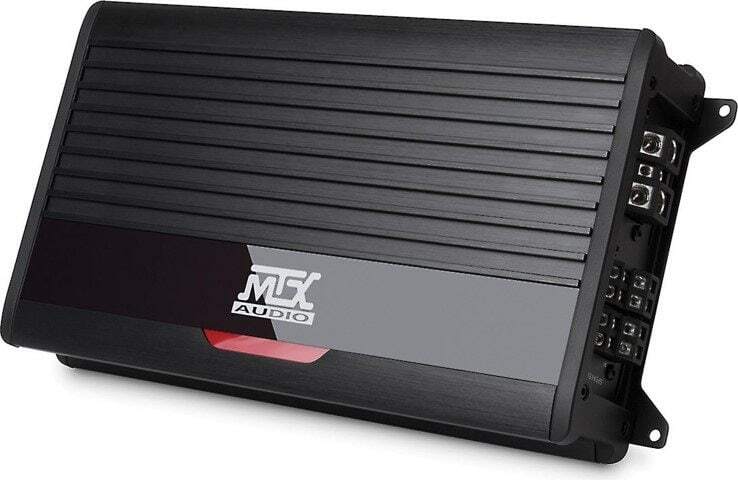 The best sounding car amplifiers have a number of important features you should be aware of before buying. It’s important to have at least some understanding of what the specifications actually mean, what kind of power rating you need, and what you can generally expect to pay. The signal-to-noise ratio (SNR), rated in decibels (dB) is a way comparing the amount of audio signal to the level of noise signal in a car amplifier. Ideally the amount of noise will be low compared to the audio signal level. A 4 channel amplifier with good sound quality will have a number around 90dB and above. The best, depending upon the rating used, will be 100dB and higher. 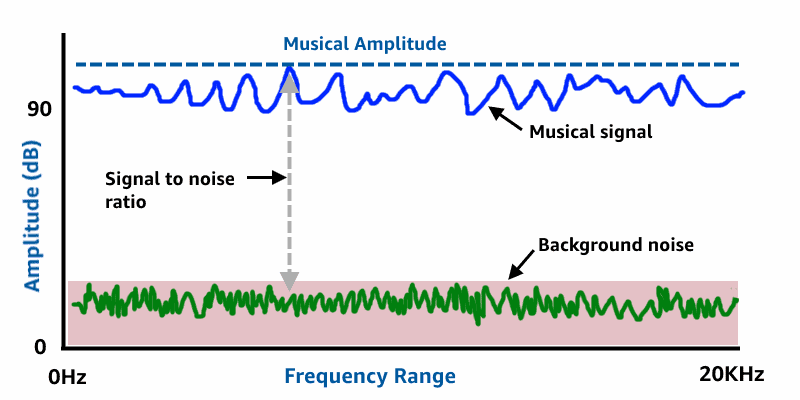 Background noise exists in all amplifiers, and appears as a slight “hiss” when you listen at high levels with no music playing. It’s also more noticeable with the amp’s gain turned up. Good amplifiers have a higher signal-to-noise (SNR) ratio. The SNR, listed in decibels (dB) is a way of comparing how much audio signal the amp has vs the amount of electrical noise it has internally. Generally speaking, the higher the number, the better. Amps with great sound quality tend to be listed as having an SNR of 90dB and above, in my experience. Some of the best list their specs at 100dB and above. However, it’s important to know that the specs can be a bit misleading. For example, it’s unfortunately pretty common for many to exaggerate their specs or they don’t list all of the ratings at certain power output levels. It’s common to see better brands list the SNR with no signal output and also at 1 watt power output, where it tends to be lower. 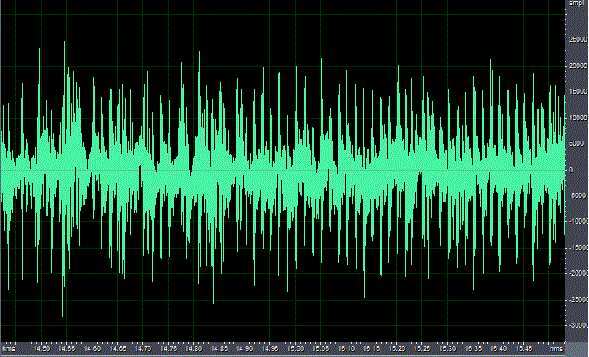 An enlarged image of the internal noise produced by a car amp (zoomed in for better viewing). Noise in an amplifier is to be expected – all amps have it! However, a good amp is designed to keep the noise low and the music signal high. In a system with great tweeters and good sound reproduction, it’s easy to hear the amp’s noise if you turn up the gain very with no music playing. Generally speaking, an amp with good sound quality will have the least amount and will be more difficult to hear. Driving your amp with a strong, high-quality audio signal means you can turn down the amp gain and keep noise to a minimum, too. A great-sounding amp like this Alpine MRV-F300 4 channel model will have good crossover features built in. While it’s important to pick an amp with the best sound you can afford, if your speakers are driven to distortion and can’t handle some frequencies any amp can sound poor. Making use of the crossovers can have a huge impact on your system’s sound quality! The speaker crossovers (normally called just “crossovers”) can be very important for a great-sounding system. What’s fantastic to know is that even budget models today have them built-in unlike many years ago. The crossovers (like on the Alpine amp pictured above) give you the ability to get more volume with less distortion out of your speakers. You’ll also get better clarity and sound quality. Basically, small speakers like coaxial door speakers and even some higher-priced component speakers simply cannot produce low-end bass well like a subwoofer can. Because of this, when playing some of your favorite music you’ll begin to hear distortion and the music will begin to break up when you start to crank the volume. 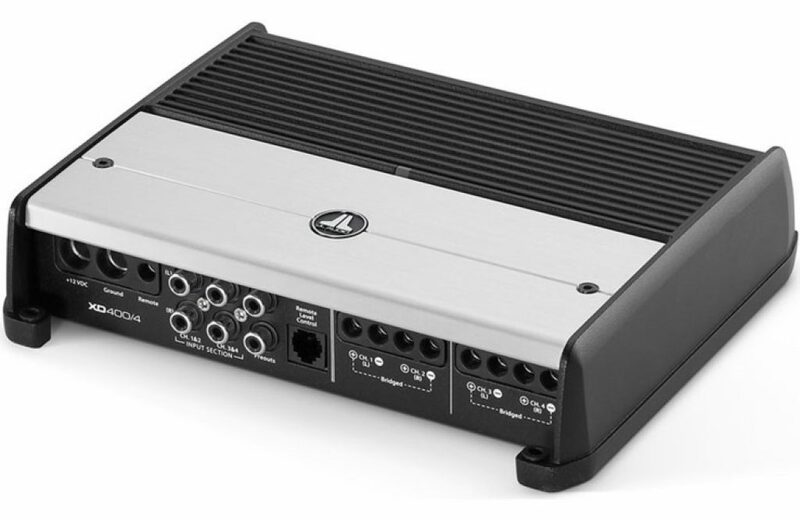 Always buy a 4 channel amplifier with high-pass crossovers built in when using the amp for full-range speaker sound. For bass, be sure to buy a model with low-pass crossovers as well. Some models have fixed cutoff frequencies (the frequency at which sounds above or below are blocked), which is less flexible than adjustable models. However, generally speaking, fixed ones are set around 50 to 60Hz which is ok in my experience. Some models also include a bass boost feature which can help if you don’t have good sound controls on your stereo. Great-sounding amps like this JL Audio XD400/4 have well thought out and designed circuit boards, better quality components, and a design goal of better sound. They place the quality of the music above cost and manufacturing shortcuts that you’ll find in low-end amps. The result is a difference you can hear. There’s quite a big difference in sound between lower quality (and cheaper) amps and car amps with better design. One huge reason why is that there are a lot of small details that get ignored by lesser amps that are used by amps with better engineering and design. What’s especially interesting to know is that you don’t have to spend a ton of money for these things – even some amps just under $200 can provide excellent sound. 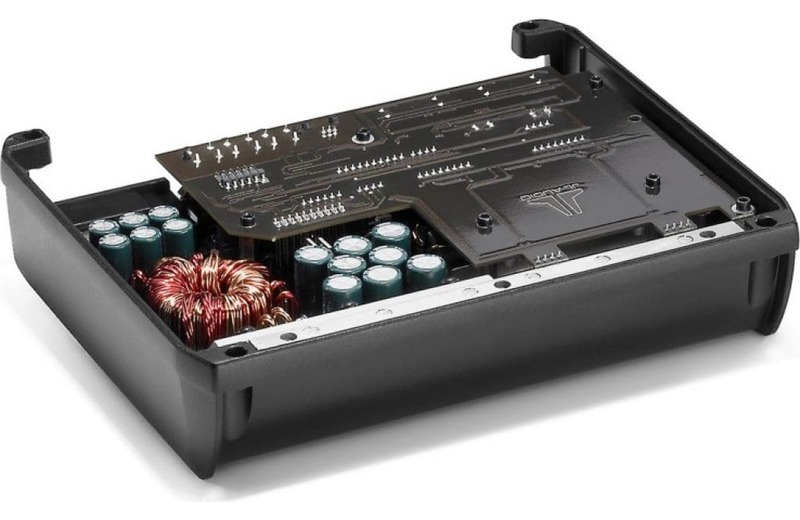 The big difference is that the respectable name brands like Alpine, JL Audio, MTX, Kicker, and others have the engineering resources and expertise to produce car amps that are designed to sound good. The problem with picking just any old car amp is that they’re designed for profit. Not for great sound quality! How can you know which models are worth buying? A great start is to check my list below. These days, high quality amplifiers provide reliable, demonstrated and documented specifications for their power ratings and sound quality. 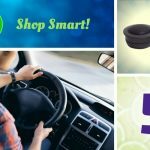 The Consumer Electronics Association (CEA) – 2006 compliance standards were established because of the confusing and misleading advertising ratings used by many car stereo manufacturers. It was created to give you clearly defined specs and ratings you can rely on when choosing an amplifier. When choosing an amp with good sound quality, it’s best to shop for models (where possible) that advertise CEA-2006 compliant specifications. Doing so means there are no advertising gimmicks and that power ratings aren’t misrepresented. For good sound, you’ll need adequate power. The reason why is that when an amplifier begins to be driven beyond its maximum power output level, it is driven into clipping, or cuts off, the audio signal driving a speaker. This is both a cause of serious, terrible-sounding distortion and potentially damaging to speakers too. Amplifiers with adequate power won’t reach this point as they’ll still have enough power remaining before they begin to produce distortion. I recommend a 4 channel amplifier with at least 50W RMS per channel for most people. If you’re like me and like to occasionally really crank it up, 75W RMS per channel is even better. Feel free to buy an even bigger amplifier if you like. The most important part is to have an amplifier with adequate power that can produce music at the volume you want without beginning to distort. 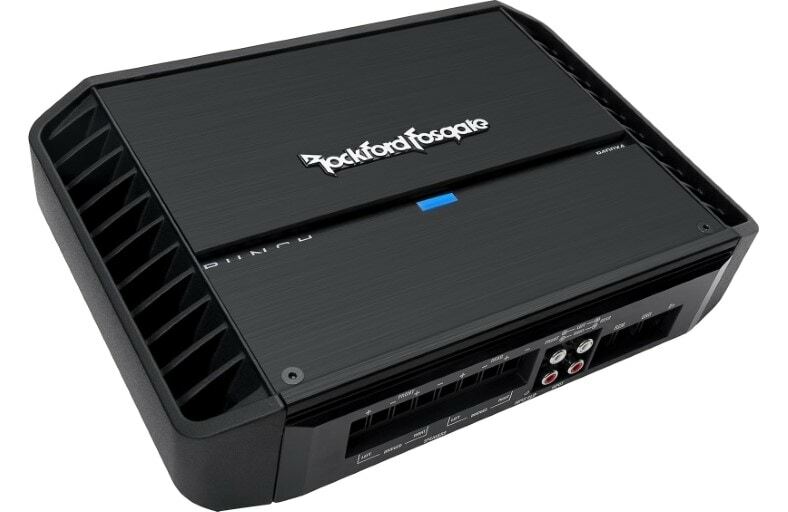 When shopping for car amplifiers, you’ll be seeing more and more models in this category. It’s helpful to know a bit more about them before spending money. You’ll also want to know a bit more about sound quality as well. Some are great and some are disappointing. Class D car amplifiers work on a relatively new type of amplifier design technology. They’re very efficient – in some cases up to nearly 90%! This contrasts with older designs which are around 65% efficient or less. What that means to you is they take up less space, generate less heat, draw less power, and often require smaller power wire. Class D car amplifiers are those designed with a different type of power supply and sound reproduction than conventional, older technology. They work off of a type of high-frequency switching supply to modulate – or “chop up” – the incoming audio signal into a continuous flow of electrical on-off pulses. These are then reconstructed and smoothed to drive speakers. Originally this was used only for home stereo amps with decent but not impressive performance. However, the technology has greatly improved and now they’re capable of producing great sound you’ll enjoy. I’ve used class D amps at home for some time now, and I’ve been pretty happy with them. Class AB amps like this Diamond Audio model take up more room, are heavier, and use much more electrical current than class D car amps. The additional metal heatsink they’re built inside of also adds to the cost. Some modern amps can deliver the same power with about 1/2 the physical size! Class AB car amplifiers (often shown as “A/B”, since it’s a combination of 2 kinds) are different from class D amps in how they operate. Unlike class D designs, their transistors are switched on nearly all the time, consuming more power. Much of this power is wasted and appears as heat. That’s one reason they’re heavier and need a large (and costly) metal body: they have to get rid of the additional heat. Even without any sound playing, you’ll notice a class AB amplifier gets warm after a period of time. Class AB designs are combination and compromise between the older class B designs (more efficient than class A, but slightly worse sound) and class A (best sound quality, but less efficient). Hence the name they’re given. They do have one advantage: The design is cheaper and easier to produce with pretty good sound on a budget. These types of amplifiers can have a harder time producing low-noise audio. One of the drawbacks to class D amps is that higher noise levels (appearing a low-level hiss and so on) are a by-product. Lower-quality amps will have an amount of noise most people can hear if they listen closely. There’s no way around it. When it comes to class D car amps, you’ll have to buy a very well-designed amplifier to get good sound quality. Cheaper brands compromise on the amount of filtering and the kind of circuitry they use. Name brand amplifiers like those I recommend below have custom designs and advanced ways of dealing with those drawbacks. Additionally, many cheaper class D car amps use off-the-shelf chips. The result is poor sound quality and high noise levels. I’ve personally tested both good and bad brands, and there’s a big difference in the sound quality! Today’s choices are very good and do a great job powering an entire system with fantastic, clear sound production…all while fitting into small spaces. Only 8-9/16 x 2-1/16 x 7-1/8" in size! Only 12-5/8 x 2.25 x 6-5/16" in size. 1. 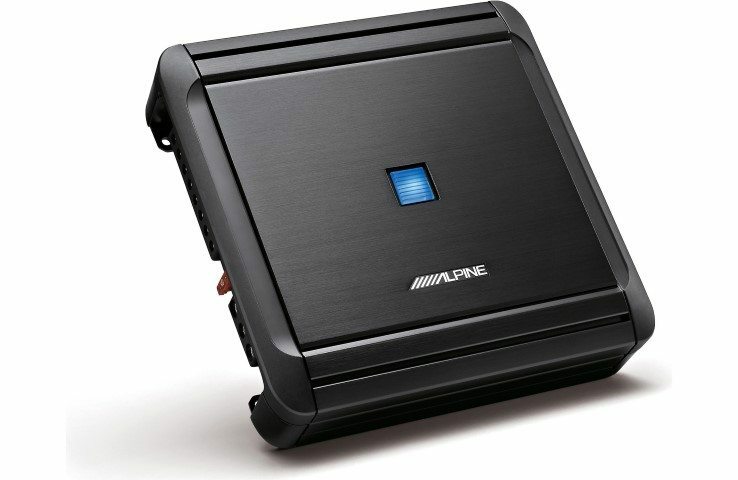 Alpine MRV-F300 – Great sound, powers a whole system, and affordable! 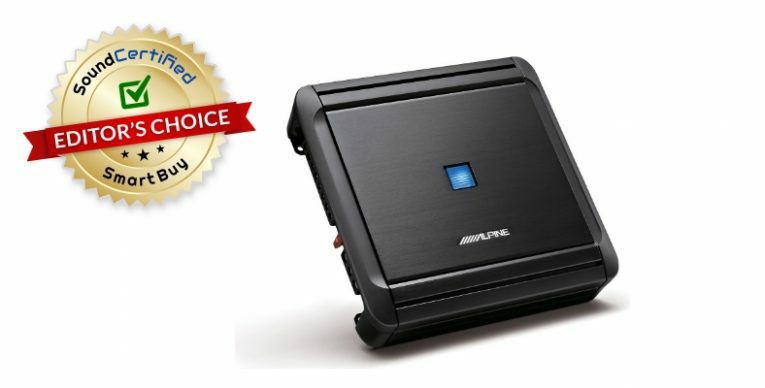 Alpine developed an affordable but great-sounding amplifier small enough to fit under a seat but still power your whole system. One of the smallest 4 channel amps on the market, the MRV-F300 puts lesser amps that are twice as big in size to shame! It’s a great-looking amp with a sleek dark brushed metal finish and cool blue power-on indicator on top. The included optional end caps snap and off for an even cleaner looking installation. For those of you looking to flush-mount your new amp in a custom install, it’s the perfect choice. The MRV-F300 is rated at a clean-sounding 50W x 4 RMS @ 4 Ohms and 75W x 4 into 2 Ohm speakers. It’s one of the best next steps in the evolution of car amplifiers. It’s bridgeable to 150W x 2 into 4 ohms, by the way. Oh, snap! So many features for the price that it’s nearly impossible to beat. Not only does it have speaker-level inputs (wiring harness included) but also adjustable high/low pass crossovers, bass EQ (boost), and removable end caps. Measuring a tiny 7 7/8″ W x 6.5″ D x 2 3/16″ H (200 x 165 x 55 mm) it fits into installation spaces that are impossible with older amps. Alpine has used their engineering expertise to create an amp that’s one of the few super-efficient class D amps in its price range with reduced noise for enhanced sound quality. Don’t just take my word for it – check the fantastic owner reviews! As expected, you’ll enjoy great system flexibility with the built-in crossovers (50-400Hz adjustable high and low pass, 12dB/octave) and a bass boost feature for channels 3 and 4. I was really impressed with this little amp for its price! So much so that I wrote a full review of the Alpine MRV-F300 here. Why did I rank this one #1? Because it’s one of the best sounding all-around values that fits in places few can. Very compact – fits under seats! The MRV-F300 check all the boxes in terms of sound quality, size, power produced, features, and quality. It also features speaker-level inputs for adding it to a factory stereo. It’s priced right for just about everyone. Definitely head over to check out the amazing reviews and happy buyers at Amazon. Always a car stereo industry leader, JL Audio has been known world-wide for excellent sound, hard-hitting power, and some of the best engineering you can buy. Their approach to building a super-compact and ultra-efficient class D amp was to take the average approach to amp design and throw it away – and used their unique NexD circuitry which uses a much faster switching speed than low-end amps do. The result is improved power delivery and much lower noise levels. As far as sound quality goes, it’s one of the best modern car amps that money can buy. The XD400/4v2 is one of the best sounding and best-designed amps in its class. The crossover features are built facing the top (which features an optional cosmetic cover) for an easier way to reach them in many systems. Note that you’ll need the included hex wrench to tighten and loosen the higher-grade wiring terminals. It’s a great amp! Specified at an under-rated 75W RMS x 4 into 4 Ohms (100W RMS x 4 into 2 Ohms) it’s capable of exceeding its rated power. Measuring a mere 8.52 in. x 7.09 in. x 2.05 in. (217 mm x 180 mm x 52 mm) it’s one of the few in its size class that can accept 4 gauge wire. Adjustable 50-500Hz low/high pass crossovers are provided for great system flexibility and to help you block distorting bass when driving full-range speakers. The 2/4 channel switch allows driving a whole front and rear system without the need for rear RCA inputs. Additionally, a pair of RCA output jacks makes it easy to connect it to a second amp for system expansion. Wire terminals are audiophile-quality and it’s one of the best-rated amplifiers sold today. If you’re looking for one of the best sounding and smallest amps today, this is it. It’s available at many places online but you can get it for a better price (and free shipping) at Amazon. Able to spend a bit more? 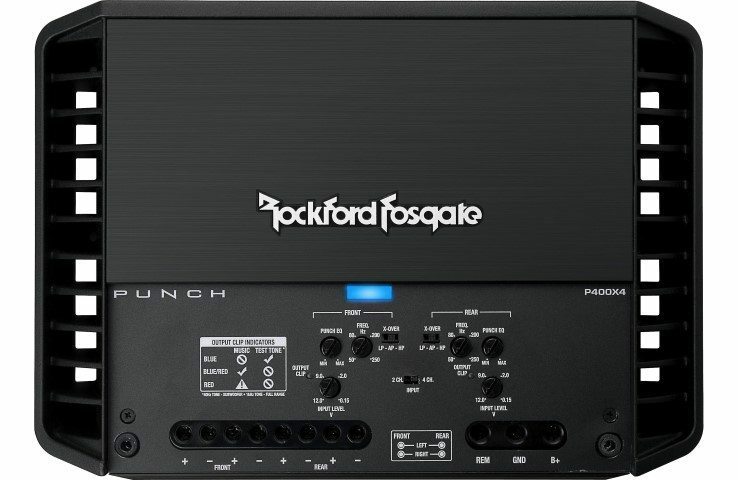 The Rockford Fosgate P400X4 provides some of the best sound out there in a 4-channel amp. While it may seem just many competitor’s products, there’s more to offer, however. Unlike other conventional A/B class amps, the company has used their own proprietary Trans-ANA circuitry design to not just reduce noise, but to take sound reproduction to the next level. It’s a well-designed amp with real engineering quality through and through. Additionally, the amp has a special heat management design using state-of-the-art microprocessor circuitry to manage heat levels without having to shut the amp off. Because of their car electronics expertise and resources, Rockford was able to fit all this into a package only 11-1/8″ x 2-7/16″ x 8-13/16″ in size. Other amps in its power and price range (near $200) can’t match the size, quality, or features. The P400X4 is capable of excellent sound quality. It’s a CEA-2006 compliant rated amp, meaning the specs are proven and reliable. Signal-to-noise (SNR) performance is excellent, with up greater than 105dB at rated power! As you can see in the image, crossovers, sound EQ options, and the set-up features are accessible with the top cover removed. A nice blue power-on indicator rounds out a sleek, modern design. High and low pass crossovers are provided and are fully adjustable from 50 to 250Hz. The Punch EQ is cool bass and treble feature that helps enhance your sound with an adjustable 0-18dB of boost at 45Hz bass or 12.5KHz for treble. An optional Punch EQ remote control know (sold separately) allows easy dashboard control of the bass level while driving. One drawback of the amp is that is doesn’t offer speaker-level inputs, but it does include a 2/4 ch. input switch. The unique feature I like about this amp is the C.L.E.A.N. gain setup system built into it. When used with the included test tone CD, the amp can show signal levels to aid in setting up the gain for optimal performance. It’s a great advantage as it makes setting up your amp for the lowest-noise and best sound levels much more easily. It’s conservatively rated, too, meaning the amp will exceed its rated power output. For added confidence when buying, a certificate of performance is included with each amp, too! It’s a fantastic amp and I highly recommend it. Be sure to check out the amazing owner reviews and the lowest price over at Amazon. Planning a system that needs a bit more power? I totally get it – in my system I’m using 4 channel amps with 75W per channel. It’s great having that power on tap. 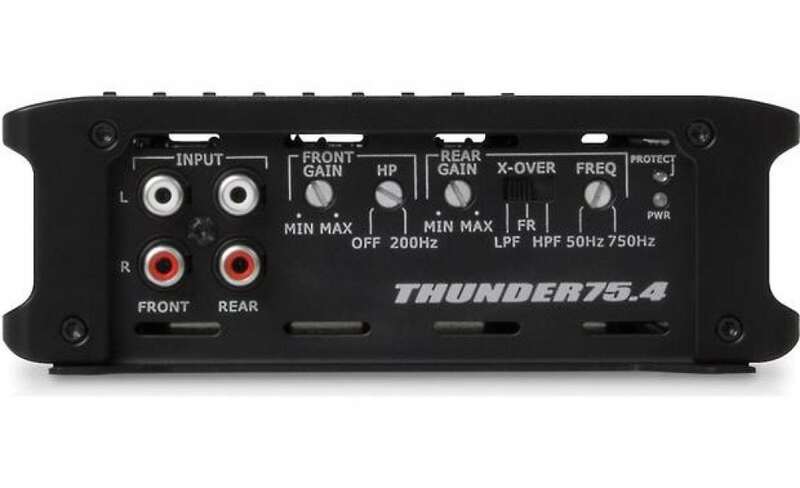 With the Thunder 75.4 you’ll get legendary MTX Audio build quality and under-rated power (yes, their amps often can go past rated power!) in a size that fits in less space. And it’s still affordable, too! The design uses tiny surface mount technology (SMT) components for shorter audio paths and for excellent resistance to vibration. Thermal, DC offset, and short-circuit protection ensures your amp will protect itself in case a problem occurs. It’s based on classic and proven A/B amp design with MTX’s own patented audio design touches. Having installed both budget and higher-end MTX amps many times, I can tell you they’re definitely well worth the money. The Thunder 75.4 is one of the smallest in its power class at only 12-5/8 x 2-1/4 x 6-5/16″ in size. It’s a great basic, hard-hitting, and compact amp. It’s well-made and a good use of your money if you’re looking for a good compromise between sound quality, power, and installation ease. I really like the user-friendly crossover features and how simple and uncluttered it is. The high-pass crossover is adjustable up to a nice 750Hz, while the low-pass is adjustable to 200Hz max. 4 gauge wiring connections are available and are very well made – they’re some of the best I’ve seen. Unfortunately, speaker-level inputs aren’t available on this model. If you demand extreme sound quality, then it’s probably not for you. However, if you’re wanted very good sound quality in a smaller, easier-to-install package that won’t break the bank, it’s a good choice. At around $200 or so, overall I’d say it’s a good value and is worth checking out. Head over now and have a look at the many happy buyer reviews left at Amazon. I’ve decided to include the KTP-445U here as well. While it doesn’t have the same high-end specs like other amps I’ve recommended, it’s a great sounding amp for more difficult installations. Some installations like pickup trucks and motorcycles are especially tough. That’s where Alpine’s expertise provides a solution not just for extremely limited amp space, but for anyone wanting an amp that’s easier to install and that draws less power. As I explained in my detailed review of the Alpine KTP-445U, it’s an example of advanced engineering and satisfying sound quality in one of the smallest sizes in the world. 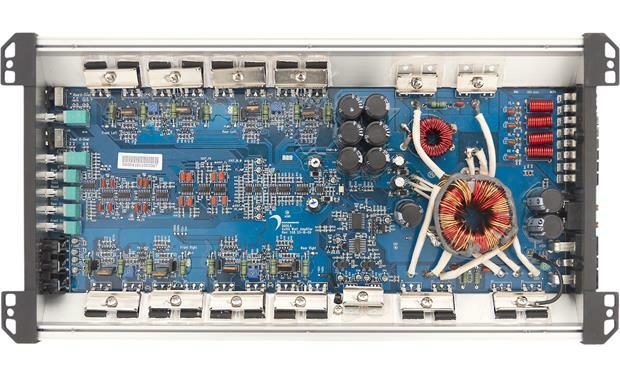 This is a highly efficient class D amp that runs cool and provides 45W RMS to 4 channels. 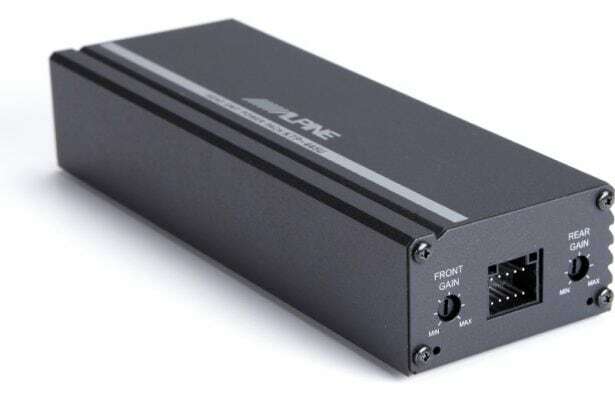 Not only that, but it’s bridgeable to 90W RMS x 2 channels, too! Despite that, it runs cool and draws minimal current. 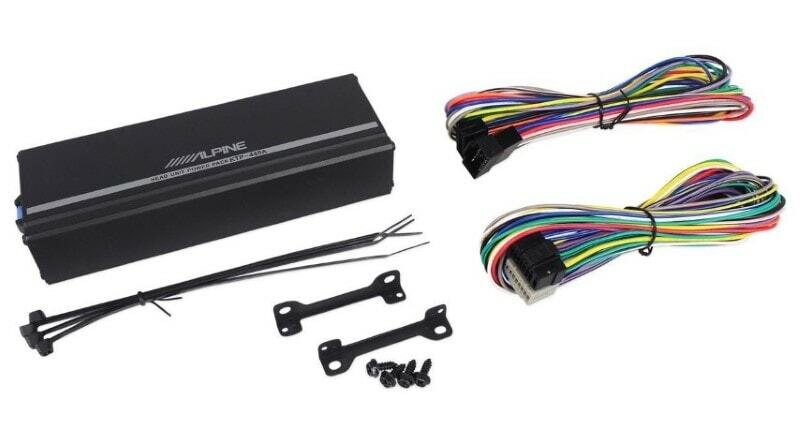 During installation you can even connect it directly to standard head unit wiring for the power supply, if using it for typical (average power) systems like driving 4 full-range speakers. It handles 2 ohm speakers as well. The KTP-445U is one of the smallest car amps in the world today. Despite measuring only a tiny 7 7/16 x 1.5 x 2.5″ (189 x 38.2 x 64.5 mm) in size, it’s capable of delivering great sound and a good frequency response. It’s so small it’s about the size of a laptop power supply – yet delivers enough power to drive a full system in your vehicle! What’s particularly great (in my opinion, based on my experience) is that it also provides both speaker level and RCA inputs. It’s a great match for both factory and aftermarket car stereos. Don’t have 4 RCA jacks, only 2? That’s no problem, either. The 2/4 channel switch allows you to drive the additional rear speakers without a problem. Alpine’s design is especially effective at reducing noise levels and to maximize sound quality while providing crisp sound and the kind of high-end treble response you’ll enjoy. Of course, quality often doesn’t come cheap, but this little guy is affordable, priced near $150 or so depending on where you shop. Ultra-compact – fits in dash or nearly anywhere! High-pass crossover not adjustable – fixed to 4 pos. Buyer reviews are great and based on my personal experience, you’re going to love it. It’s an installer’s dream come true, too! I’ve found some of the best pricing anywhere here at Amazon. Don’t forget your amp kit! Check out my helpful guide for good amp kits here. Need some more information on how to install it? Here’s a great guide on how to hook up a 4 channel amp to front and rear speakers. Will totally check those out! Thanks so much for sharing! I plan on buying the jl audio xd400/4v2. What speakers do you suggest i should go for? Components in the front and coaxials on the rear. Hi there! That’s great I’m sure you’ll enjoy your new amp. Very good sounding speakers for a good price, too. Well-designed. I’m sure you’ll enjoy those speakers/speakers from those product lines. Good materials for both the woofer and tweeters as well as good quality crossovers.